1.Dome Bind varylight+hdir,Use vray lights bind HDIR Anime. 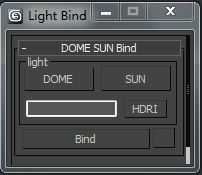 2.First pick dome, light and select HDIR, click on the button binding. 3d max 2014 can not be used. I test it, you can, and then you try to pick up after the lights, choose hdir. Then click Bind.